Jute and other plant-based fibers are a popular choice for carpets today. 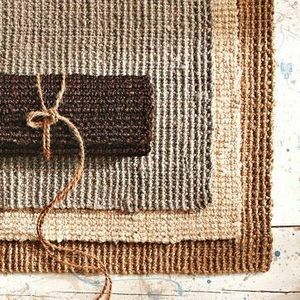 Jute can be used as a part of a blend of materials or as a carpet backing. It is easy to ruin jute by using the wrong cleaning methods or products. It is especially sensitive to excessive moisture. High Quality Carpet Cleaning has extensive experience with cleaning a wide range of materials. Their team of highly trained specialists can provide your jute carpet or rug with a deep clean that will not harm its straw-like fibers. Let the most respected cleaning professionals revive your carpets at prices that are hard to ignore. Carpets containing jute, hemp and coconut are notoriously sensitive to conventional cleaning methods. Much of the harm to jute carpets comes from over-wetting the fibers. This is not the case with High Quality Carpet Cleaning. They understand that each material has its own cleaning requirements. No one would throw all their clothes into the washer and hope for the best. It is the same with carpet cleaning. Select a team of highly trained professionals that knows just what it takes to maintain jute carpets and rugs. Jute that is exposed to a lot of moisture can shrink and tear. This can easily ruin an expensive carpet or rug. The experts understand that too much water can spoil a beautiful jute carpet. High Quality Carpet Cleaning can provide a low-moisture carpet cleaning. This kind of method uses only a fraction of the usual moisture required to clean a typical carpet. It also uses an agitator to work the dirt out of delicate fibers without having to saturate them. Powerful cleaning agents free dirt and grime from jute carpets quickly and easily. Everything is then dried to keep jute free of moisture. All this is done without harming this sensitive material. The importance of keeping jute carpets dry cannot be stressed enough. This material can easily lose its shape. Its colors can also bleed due to excess water. Discoloration and tearing is nearly impossible to fix. Do not risk having this material cleaned improperly. Get professional assistance with any delicate fiber or fabric now. Contact High Quality Carpet Cleaning to ensure that the job is done right. Their technicians have extensive experience with jute carpet cleaning. Dry extraction or low-moisture carpet cleaning keeps jute carpets and rugs clean and undamaged. Jute carpets and rugs are also susceptible to mold and mildew. Their straw fibers can easily retain water. A moist environment makes the perfect home for mold and mildew. Either can lead to serious health problems. They can also help deteriorate jute and plant-based fibers very quickly. The only answer is to consult with the most respected carpet cleaning professionals. They can remove moisture quickly and provide solutions that keep jute carpets looking like new. Contact High Quality Carpet Cleaning for a consultation and see why they are New Jersey’s first choice in cleaning services.